If you have a Virtuoso printer and/or use CreativeStudio, chances are you have Virtuoso Print Manager installed on your computer. The question is, do you know what you can do with this powerful bit of software and how it can help simplify your sublimation production? 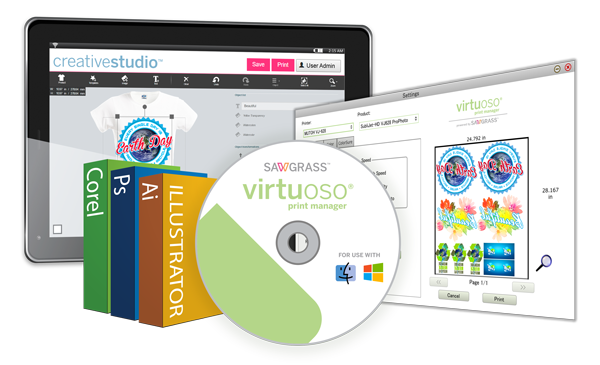 Virtuoso Print Manager is essentially a color and print management program that helps bring the designs you create on your computer to your printer. Why do you need special software to do this? First, computers design in three colors: red, blue and green. Your printer uses at least four colors: cyan, magenta, yellow and black. The printer needs information from the computer telling it how much of each color to use to create the colors you want. Second, the colors on the print you see when you use a sublimation printer are not what will be on your substrate after pressing. Prints look washed out when they come from the printer because the color in the dye solids of your sublimation ink are not expressed until they actually sublimate in the heat press. This means that the printer needs a lot of additional information – such as the type of substrate and paper you’re using – to be able to print the correct ratio of colors. Compatibility with Multiple Graphics Programs: Virtuoso Print Manager enables you to accurately manage colors using a wide range of popular graphics programs. These include Virtuoso CreativeStudio Online Designer, CorelDRAW, Photoshop/Photoshop Elements, Illustrator, Silhouette, SubliEVO and more. This means you can design in your preferred program and easily send your designs to print right from your user interface. Hot Folders: This is a handy feature that enables you to drag and drop files into a folder and have specific print settings applied to those files. For example, you could set up a Coasters hot folder that will apply the same print speed, substrate, paper, color and layout settings to every image you save to that folder. No more having to spend time making sure your settings are correct. Just drag, drop and print. Automatic Image Grouping: If you want to print several images at once (another great feature! ), this feature lets Virtuoso Print Manager arrange your images to fit onto as few pieces of paper as possible. This feature is activated on the Layout tab of Virtuoso Print Manager’s user interface. Click on the VPM Performs Layout button and choose your paper type. This will cause Virtuoso Print Manager to automatically arrange your images onto one or more pages. You can even add in some extra space if you like. Spot Color Management: When hitting a specific color is essential, so is spot color management. Virtuoso Print Manager offers a Palette Manager feature that allows you to import palettes you created in PowerDriver and create/find specific colors for new projects. Once you’ve found the right color, you can save it to your palette for easy application the next time you need it. If you haven’t already worked with Virtuoso Print Manager, now is a great time to get started. Contact your Conde representative for more information about installing and using Virtuoso Print Manager.